We need a few tools. Each family will need a tape, (12 ft is plenty), a block plane, a battery drill ( screw gun), a sanding block, caulking gun, and a few things I've not thought of. Anyone out there willing to loan some tools to the project will mean less tools we have to buy. Volunteers to oversee the building. Each "family" is different, some will need constant help, others will need only an answer to "what do we do next". We also need someone around to make sure tools are "as they should be" and switching out batteries, etc. Since we looking at 6 to 10 families (8 is optimum), we hope for one boatwright for every two boats. Volunteers to build the kits. We are providing a complete set of parts. All a family need do is assemble. All those parts have to cut out, double checked, marked, etc. The heavy lifting will take place after the prototype is done, say the 1st Sat in aug, the 7th. there's plenty of work to be done before then and help is welcome. Logistics. We have a loan of two 20 x 20 canopies. (thank you Steve Mahoney). We may well need more cover or at least could use some more for our own booths, tool table, "buy a hat" kind of stuff. some of you may have these 10 x 10 canopies (the kind you see at every soccer game, etc) that could be of help. The club has one (or two) but they need to be checked out to be sure all the parts are there. Any help in this regard would be appreciated. The two days of the event would benefit from one or two people willing to "run get what we forgot". 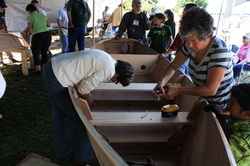 RiversWest, together with the Oregon Maritime Museum will host Portland's first ever Family Boat Build at the annual River Fest weekend, August 21-22, at the downtown waterfront. Anyone wishing to participate as a volunteer helper or who knows of a family who might wish to join in, please contact Chuck Stuckey, President, at 503-287-2065. The ideal family is one or two parents and kids about 8 to 12 years old. We expect this to be a lot of fun and the participating families can take their boat home with them.